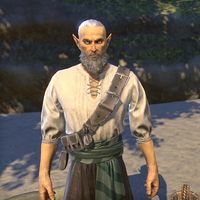 Curtaros is an Altmer fisherman initially found in Wasten Coraldale. He and his crew have stumbled into a Maormer invasion of the small island and it's up to you to return them home. "Wah? Hm? Who's there? Quiet down, you'll spook the fish!" "Never seen you before. Guess no one told you that this is my spot. Been my spot nearly a century, and it'll be my spot a century more—gods willing—so don't go getting any idea. Plenty of space down the coast, so off with you now." Your daughter asked me to find you. The island is swarming with Maormer. Follow me. "Huh, fancy that. I'd told Hiranesse for years those Sea Elves would mount an invasion from Wasten Coraldale. Figures they'd launch it while I'm having a nap. Well, come along then. Best send them off before they hook all the best catches." You want to drive off the Maormer? "Of course. Any Royal Marine of the Queen's Navy worth their salt would. Might have traded my saber for a fishing rod, but I've still got my sea legs and I'm still as sharp as they day I mustered. The othera I sail with are civilians though." You think they're in danger? "Aye. Even if they caught a glimpse of a Sea Elf cutter before it reached Wasten Coraldale, there's no chance a fishing boat would have outrun it. If anyone form the fleet's still alive out there, it's our duty to help them." Let's search for the other survivors then. "Best we split up. Unless my creaking knees give me away, I ought to be able to handle some scouting while you're searching for survivors. We'll rendezvous at the old lover's tree, near the reef on the eastern shore. My friends will know the one." Are you going to be alright on your own? "Unless I'm caught. Won't be much use to the Sea Elves as a prisoner, but I'll black an eye or two before I greet my maker." What am I supposed to tell your daughter if you get yourself killed? "Tell her my children are grown and my wants are few, but I can't say the same for my friends. I've had a good life. I don't mind trading what's left of it so others might have the same." How many people made up your fleet? "Three aside from myself: Emdoline, Aldotarel, and Cartorrel. Not much of a fleet when you compare it to the Royal Armada, but we're the scourge of anything with gills. Hope you find them safe and sound." You're certain none of them could have escaped? "Too quiet. If one of them had reached the mainland, the Royal Navy would have sent ships to intercept these Sea Elves by now. No one knows they're here, except us." What are you planning to scout? "Enemy movement. Number. Positions. Assess our situation. I hope to have a plan by the time you've finished your search." "All this crouching is damnation on my back, but I've seen everything I need to know what the enemy's up to. How fairs the search? Any sign of Cartorrel?" Sorry, not everyone made it. "Never do, when it comes to these Sea Elves. They'll rob us of more than a few good souls before all is said and done here." "They're digging in. Placing ballistae along the shore. When the Royal Navy finally does mount an attack, they'll be taking fire from Maormer on both land and sea. It'll be a bloodbath, unless some misforturne befalls their plans. Catch my drift?" What can the two of us do about it? "I'm not suggesting we repel the whole invasion, but I do know my way around a ballistae. If we turn one toward their own ships and cause enough of a stir, we can draw in a friendly patrol and catch the Sea Elves out of their element." "I'll get into position and await your attack. Then we'll give those sea snakes a good spearing while these two make for your vessel. You do have a vessel don't you?" There's a small sailboat in the cove beyond the caves that we can use to escape. "All right. You two, go prepare the boat our friend brought. We'll provide a distraction. Trinimac's wrath be with us." "Hold them off while I spear that cutter!" "They're scattering like minnows! Keep on the offensive!" "They didn't call me the scourge of the sea drakes for nothing!" "That'll do! Fall back and get to the boat!" "Captain coming aboard! Boat's prepped and ready!" Hiranessse: "Father! You had me so worried! What happened? Where's your boat?" Curtaros: "None of that now, my nervous gup. I'll tell you all about it, but first there's one more thing we need to see to." "Come, friends. It's time we commit our memories to the drink." Can he be spoken to before the above conversation occurs? Curtaros "My star-eyed bride of Alinor, lost in storm an spray, my star-eyed bride of Alinor, that cruel fate took away." Wendlain: "That was beautiful, Curtaros. She would have loved it. I never knew you could sing." Aldotarel: "The old man is full of surprises." He can also be spoken to and asked about his military past and the reasons he kept it quiet. "I hoped we'd cross paths again, friend. Come, raise a toast with us to Cartorrel. You never knew her, but she'd have welcomed you with open arms." Maybe in a bit. I had some things to ask first. "I expect you do. Go on then." Why'd you keep your military service a secret? Even from your own daughter? "I was proud to serve. I still am, but I put that bloody life behind me to raise my daughter. I wanted her to know her father's face, and always remember it fondly. I didn't want her to hate the sea." Why would she hate the sea? "The sea took her mother. She was an officer in the Royal Navy, like me. 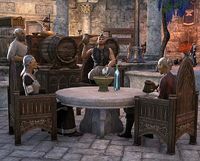 She'd just returned to duty after our daughter was born when the Sea Elves struck at Auridon. Ugly year. The tempest that washed her overboard was red as Russafeld wine." Hiranesse deserves to here the truth from you. "I know. She's no child anymore. She's been ready to hear the truth for a long time, but I fear she'll never forgive me for lying all these years. Scares me more than anything I've had to face." I can see why you'd want to shield your daughter from that. She just want(sic) to know her father. "All I wanted was for her to be able to love the sea as much as we did. I just wanted her to be happy. Foolish. She's seen right through me for a long time. I'm afraid she'll never forgive me for keeping the truth from her all these years." "Fair. Neither of us has seen him in a long him in a long time. I'll do what needs doing...after we've finished our mourning I'll bury the lie as well." Did you meet your wife in the Royal Navy? "Aye. Served nearly a decade under the same sails. Took our vows on the open ocean with the captain's blessing. She loved the water as much as I did. We never found her, after the battle, but I visit the only memorial I have to her every year." "Where our family was born. We spent many a night under that old tree along the coast of Wasten Coraldale. I'll be damned if I was going to let the Sea Elves take that away from me too." "The Star-Eyed Bride of Alinor. An old sailor's dirge. And hand worth their salt knows it by heart. You don't make your living on the sea without finding reason to sing it." This page was last modified on 10 October 2018, at 05:39.